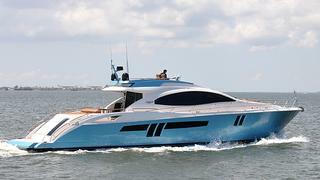 She's not quite a superyacht, but Tony Lazzara at HMY Yacht Sales tells me he acted for buyer and vendor in the sale of the 23.8m motor yacht The Good Life. A flybridge express yacht from the Lazzara yard in 2010, The Good Life accommodates eight guests in four staterooms including a full beam master suite. Notable features include four Volvo IPS pod drives, TRAC stabilisers and a hydraulic swim platform. The Good Life was asking $2.7 million.